Keen to make the best use of the boat the charity organised another fundraising row this time from from Whitby to Scarborough to coincide with Scarborough's annual lifeboat weekend on the 1st August. 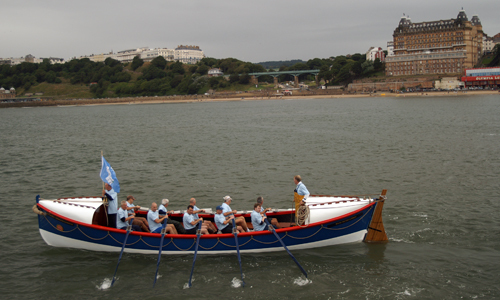 The intention was for volunteers from our local rowing club (The Fishermen’s Amateur Rowing Club) to row the boat on the 29th July to Scarborough thereby arriving in advance of the weekends events. The rowing club crew are practising for a 22 mile long row on the Thames in 2010, when they hope to take the William Riley with them. Rowing against the tidal flow, they expected to be on passage for around 8 hours. Sadly though journey was cancelled due to poor weather, it had been raining heavily for most of the morning but it was the strong wind that eventually prevented any departure. The return to Whitby took place on Saturday August 1st departing from Scarborough Harbour at 1330hrs, about ½ hour before high water with plans to arrive at Whitby 1830 hours. The weather forecast was for more rain but with less wind. The lifeboat requires 10 rowers, a bowman, one qualified coxswain and an assistant coxswain, and for safety reasons the boat had to be accompanied by a safety boat capable of pulling the 2.5t 34ft former lifeboat. 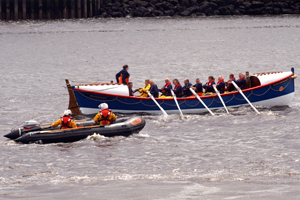 The rowers were drawn from the Scarborough Rowing Club, the Sub Aqua Club and some of the Scarborough Lifeboat crew. My wife and I went through to see the boat off on a day when the weather was constantly changing, we arrived to see the boat transfer to a pontoon nearer the pier where a small crowd had gathered. It was a pleasant day and we were pleased to see the boat off and then arrive back at Whitby later that day. The drop down box is linked to gallery pages related to the Scarborough to Whitby row and I hope you find them of interest.